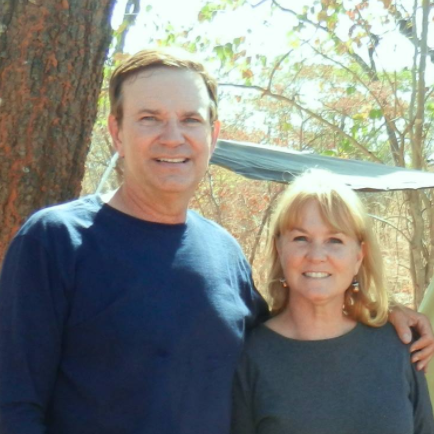 After a 23 hour plane trip to Livingstone, Africa, we settled into our tent at base camp to start the course work for Advanced Missions Training with Overland Missions. A few days later, our first expedition into the bush took 8 hours by truck on twisting, bumpy dirt roads to the mountainous chiefdom of Simwatachela. We camped for 5 days on a dirt soccer field, cooked over a fire, and used the bushes for bathrooms. -The area is an amethyst mine and villagers use flawed stones as gravel. – Speaking the message of Jesus to the school children (gr. 1-12) for 3 assemblies to share Bible stories, testimonies, songs, and Bev’s harp playing. – Hearing Bev’s African name of Mamma B (short for Beverlie) ring out from the school kids as we hiked throughout the hills of the community about 7 hours per day. about 500 villagers twice. There were miraculous commitments to Christ and answered prayers after each showing. – Seeing the excitement on the headman’s face as he related the villagers’ stories of multiple healings. – Many villagers renounced their allegiance to witch doctors and committed their lives to Christ. – Seeing the hope in the eyes of teenagers as we prayed for favor in school and their desired careers. -Rejoicing with an older woman who after her healing, danced back and forth with new strength in her arms and legs without pain. – Having celebrity status as the white “Mekuhas” and having the kids follow us constantly. – Being awakened by donkeys roaming through camp early in the morning. – Using 3 different interpreters to translate from English to Tonga and back. -Seeing the needs of these villagers who are subsistence farmers, living in mud huts with thatched roofs and dirt floors as they have for many, many years. We will never forget the hope in the villagers’ eyes and their bright smiles (say “Sayka” and smile) as they accepted Jesus as their Lord and Savior. Meeting at the village well for water, we realized that even though we all attended different churches and came from different cultures, we all came to the same well – Jesus Christ – to find His living water. Posted on May 26, 2012 by fullersmission. This entry was posted in Afica, Newsletters and tagged adventure, africa, christ, god, learning, Trip. Bookmark the permalink.